A New York Times bestseller, this “epic and elegant” biography (Wall Street Journal) profoundly recasts our understanding of the Vietnam War. 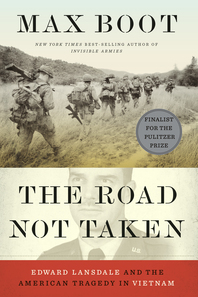 Praised as a “superb scholarly achievement” (Foreign Policy), The Road Not Taken confirms Max Boot’s role as a “master chronicler” (Washington Times) of American military affairs. Through dozens of interviews and never-before-seen documents, Boot rescues Edward Lansdale (1908–1987) from historical ignominy to “restore a sense of proportion” to this “political Svengali, or ‘Lawrence of Asia’ ”(The New Yorker). Boot demonstrates how Lansdale, the man said to be the fictional model for Graham Greene’s The Quiet American, pioneered a “hearts and minds” diplomacy, first in the Philippines and then in Vietnam. Bringing a tragic complexity to Lansdale and a nuanced analysis to his visionary foreign policy, Boot suggests Vietnam could have been different had we only listened. With contemporary reverberations in Iraq, Afghanistan, and Syria, The Road Not Taken is a “judicious and absorbing” (New York Times Book Review) biography of lasting historical consequence.